American sterling silver napkin ring, c.1910. 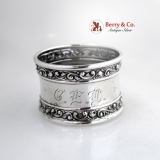 This beautiful napkin ring is monogrammed V and measures 1 3/4" in diameter, 1 1/8" tall and weighs 13 grams. The excellent original condition safe for a minute crack on the rim, clear, crisp detail, with no removals, repairs or alterations, make this an especially attractive offering. Monogrammed as described above, the soft, warm, original antique finish is present, with no buffing or machine polishing. American sterling silver, napkin ring by Gorham Silversmiths, c.1950. 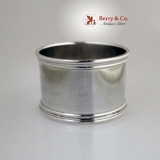 This handsome napkin ring measures 1 7/8" in diameter, 1 1/8 tall and weighs 19 grams. The excellent original condition and clear, crisp detail, with no monograms or removals, repairs or alterations, make this an especially attractive offering. American sterling silver napkin ring, c.1893. 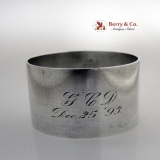 This plain yet handsome napkin ring is monogrammed GCD Dec. 25 ′93. and measures 1 5/8" in diameter, 1 1/4" tall and weighs 35 grams. The excellent original condition and clear, crisp detail, with no removals, repairs or alterations, make this an especially attractive offering. Monogrammed as described above, the soft, warm, original antique finish is present, with no buffing or machine polishing. American sterling silver Arts and Crafts napkin ring by Shreve and Company, San Francisco, c.1915. 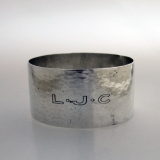 This hand made and hammered large napkin ring is monogrammed, in Arts and Crafts style block letters Lâ—‹Jâ—‹C, is 1 15/16" in diameter, 1 3/8" tall and weighs 35 grams or 1.1 ozs. Troy. Monogrammed as described above, the soft, warm, original finish is present, with no buffing or machine polishing. The excellent original condition and clear detail, with no removals, repairs or alterations, make this an especially attractive offering. Solid Silver napkin ring with 5 high relief Thai figures, c.1940. This highly ornate napkin ring measures 1 7/8" in diameter, 1 3/8" tall and weighs 38 grams. No monograms or removals, excellent original condition. 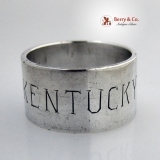 American coin silver napkin ring inscribed Kentucky 1862. Definitely one of the more unusual napkin rings that we have offered for sale, this luncheon sized heavy napkin ring has a later sterlingmark on the inside. Weighing a substantial for its size 33 grams or 1.1ozs. Troy, this special napkin ring is 1 1/4" in diameter and 3/4" tall. Inscribed as described above, the soft, warm, original antique finish is present, with no buffing or machine polishing. The excellent original condition and clear, crisp detail, with no removals, repairs or alterations, make this an especially attractive offering. American coin silver napkin ring, c.1870. 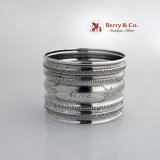 This attractive napkin ring has Palmette and wide reeded double bands on a shaped body with a central inscription Alcie. 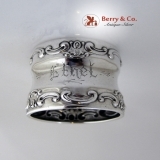 Weighing 14 grams, this special napkin ring is 1 5/8" in diameter and1 1/2" tall. Inscribed as described above, the soft, warm, original antique finish is present, with no buffing or machine polishing. The excellent original condition and clear, crisp detail, with no removals, repairs or alterations, make this an especially attractive offering. English sterling silver engine turned napkin ring withthe maker′s mark being struck s oas to be unidentifiable, with a full set of Birmingham Hallmarks for 1939. This handsome napkin ring, with its allover engine turned decorations is 1 3/4" in diameter, 1" tall and weighs 15 grams. The excellent original condition and clear, crisp detail, with no monograms, removals, repairs or alterations, make this an especially attractive offering. The soft, warm, original antique finish is present, with no buffing or machine polishing. 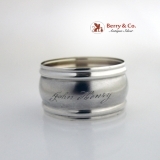 American sterling silver Aesthetic style napkin ring inscribed John Henry, c.1880. Even thoughJohn Henry, the Steel Driving Man was likely not the owner of this attractive foliate engraved napkin ring, the name is still powerfully evocative. Weighing 12 grams, this interesting napkin ring is 1 1/2" in diameter and 1 1/8" tall. Inscribed as described above, the soft, warm, original antique finish is present, with no buffing or machine polishing. The excellent original condition and clear, crisp detail, with no removals, repairs or alterations, make this an especially attractive offering. 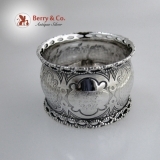 American sterling silver napkin ring in the Strasbourg pattern by Gorham Silversmiths, c.1900. 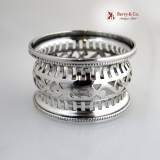 This beautiful napkin ring measures 1 5/8" in diameter, 1 1/2" tall and weighs 22 grams. Monogrammed Ethel. Excellent original condition. American sterling silver cut out applied beaded border napkin ring by The Webster Company, c.1910. 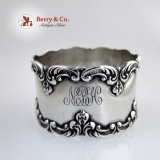 Monogrammed H, this special napkin ring weighs 20 grams and is 1 7/8" in diameter and 1 1/4"tall. Monogrammed as described above, the soft, warm, original antique finish is present, with no buffing or machine polishing. The excellent original condition and clear, crisp detail, with no removals, repairs or alterations, make this an especially attractive offering. Egyptian sterling silver open work napkin ring, c.1940. This unusual napkin ring measures 1 1/2" in diameter, 1 1/8" tall and weighs 29 grams. No monograms or removals, excellent original condition. 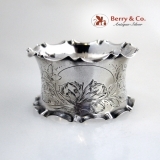 American sterling silver double walled floral Repousse napkin ring, Unger Brothers, c.1900. This beautiful napkin ring measures 1 5/8" in diameter, 1 1/4" tall, weighing 27 grams. Mongrammed EK. Very good original condition safe for a couple minute cracks along the rim, crisp detail, with no removals, repairs or alterations, make this an especially attractive offering. American sterling silver napkin ring in a floral scroll pattern by Gorham Silversmiths, c.1900. 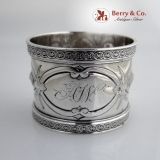 This elegant napkin ring has bands of Repousse floral and scroll decorations and a body with the period monogram" CEL. Weighing 17 grams, this elegant napkin ring is 1 3/4" in diameter and 1 1/8" tall. Monogrammed as described above, the soft, warm, original finish is present, with no buffing or machine polishing. The excellent original condition and clear detail, with no removals, repairs or alterations, make this an especially attractive offering. American sterling silver napkin ring, Gorham Silversmiths, c.1890. This beautiful napkin ring measures 1 3/4" in diameter, 1 1/4" tall, weighing 26 grams. Monogrammed NBH. The excellent original condition and clear, crisp detail, with no removals, repairs or alterations, make this an especially attractive offering. American Sterling Silver Napkin Ring USMA West Point Owen Smoot Nibley Class of 1950 USMA. Dimensions:1 3/4" - 1 1/4" weight 55 grams 1.8 ozs Troy. The excellent original condition and clear, crisp detail, with no removals, repairs or alterations, make this an especially attractive offering. Monogrammed as described above, the soft, warm, original antique finish is present, with no buffing or machine polishing. American coin silver napkin ring, Gorham Silversmiths, c.1890. This elegant napkin ring measures 1 3/4" in diameter, 1 3/8" tall, weighing 35 grams. The excellent original condition and clear, crisp detail, with no monograms or removals, repairs or alterations, make this an especially attractive offering. American sterling silver napkin clip in the Baby pattern by Watson Silversmiths, c.1910. This special, heavy napkin clip is cut out and engraved Baby and is 2" long, 7/8" wide and weighs 12 grams. The excellent original condition and clear, crisp detail, with no monograms, removals, repairs or alterations, make this an especially attractive offering. The soft, warm, original antique finish is present, with no buffing or machine polishing. 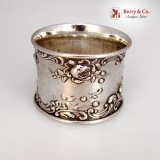 German 800 silver napkin ring floral engraved, c.1890. 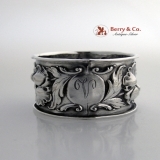 This beautiful napkin ring measures 2 1/8" in diameter, 1 1/2" wide and weighs 25 grams. Excellent original conditions, no monograms or removals. 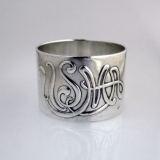 American sterling silver Art Nouveau napkin ring, c.1900. 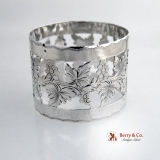 This elegant Repousse napkin ring has allover Lily decorations and is inscribed Julia. Weighing 15 grams, this special napkin ring is 1 1/2" in diameter and 1 1/4" tall. Inscribed as described above, the soft, warm, original antique finish is present, with no buffing or machine polishing. The excellent original condition and clear, crisp detail, with no removals, repairs or alterations, make this an especially attractive offering. American coin silver napkin ring with a Civil War era inscription H.W. Fales 1863. This handsome napkin ring has a tapered body with engine turned decorations and a large, oval foliate engraved cortouche containing the above CivilWar erainscription. The rims have engineturned decorations. Weighing 26 grams, this special piece of American history is 1 7/8" in diameter and 1 1/8" tall. Inscribed as described above, the soft, warm, original antique finish is present, with no buffing or machine polishing. The excellent original condition and clear, crisp detail, with no removals, repairs or alterations, make this an especially attractive offering. American sterling silver napkin ringby James E. Blake, c.1910. This elegant cut out design napkin ring has engraved grapes and grape leaves decorating its body and scalloped, engraved rims. 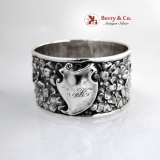 Weighing 22 grams, this special napkin ring is 1 3/4" wide and 1 5/8" tall. The excellent original condition and clear, crisp detail, with no monograms, removals, repairs or alterations, make this an especially attractive offering. The soft, warm, original antique finish is present, with no buffing or machine polishing. American coin silver napkin ring by Wood and Hughes of New York City, c.1870. 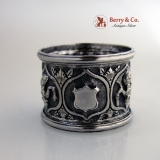 This elegant Repousse napkin ring has scroll bordered Thistle decorations on both sides of the large, scroll cartouche containing the monogram AW. The applied, die rolled star and scroll borders add to the appeal of this special napkin ring. Weighing 36 grams or 1.2 ozs. Troy. Monogrammed as described above, the soft, warm, original antique finish is present, with no buffing or machine polishing. The excellent original condition and clear, crisp detail, with no removals, repairs or alterations, make this an especially attractive offering. 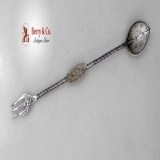 American sterling silver combination olive fork and soon in an Aesthetic floral design with a trefoil cutout bowl having engraved foliate designs. Twist handles are on each end of the chased floral medallion, with the trident fork having engraved tines. Marked sterling, it also bears the retailer′s mark of Charles F. Rudolph of Wilmington Delaware, in business from 1870 - 1900. This elegant, unusual server, which could also be used for oysters, is 11" long and weighs 41 grams or 1.3 ozs. Troy. The soft, warm, original finish is present, with no buffing or machine polishing. The excellent original condition and clear, crisp detail, with no monograms, removals, repairs or alterations, make this an especially attractive offering. American sterling silver napkin ring with applied rose and scroll decorations, made by Gorham Silversmiths, c.1900. 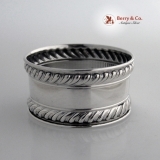 This beautiful napkin ring measures 2" - 1 1/2" and weighs 41 grams or 1.3 ozs Troy. It has the name Laure Simpson inscribed on the interior. Inscribed as described above, the soft, warm, original finish is present, with no buffing or machine polishing. The excellent original condition and clear detail, with no removals, repairs or alterations, make this an especially attractive offering. 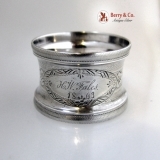 American sterling silver napkin ring, Gorham Silversmiths, date marked for 1896. 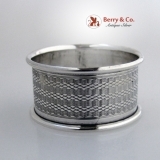 This handsome napkin ring measures 1 7/8" in diameter, 1 3/4" tall and weighs 42 grams. The soft, warm, original finish is present, with no buffing or machine polishing. The excellent original condition and clear, crisp detail, monogrammed C G Mc C, no removals, repairs or alterations, make this an especially attractive offering. German 800 silver napkin ring, c. 1890. This beautiful napkin ring measures 1 3/4" in diameter, 1 7/8" tall and weighs 21 grams. The soft, warm, original finish is present, with no buffing or machine polishing. The excellent original condition and clear, crisp detail, monogrammed LK, no removals, repairs or alterations, make this an especially attractive offering. American sterling silver napkin ring by Gorham Silversmiths, date marked for 1884. 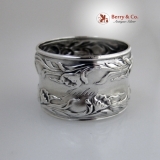 This beautiful napkin ring measures 1 7/8" in diameter, 1 3/4" tall and weighs 29 grams. The soft, warm, original finish is present, with no buffing or machine polishing. The excellent original condition and clear, crisp detail, monogrammed Mary 1887, no removals, repairs or alterations, make this an especially attractive offering. American coin silver napkin ring with a bellied engine turned and embossed paneled body having open work, applied twisted rope borders, c.1860. 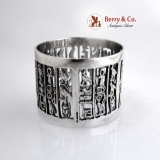 The large, shaped cartouche contains a period script presentation monogram: WA from FAM. This beautiful napkin ring measures 1 3/4" in diameter, 1 1/4" tall and weighs 24 grams. Monogrammed as described above, the soft, warm, original finish is present, with no buffing or machine polishing. The excellent original condition and clear, crisp detail, with no removals, repairs or alterations, make this an especially attractive offering. American coin silver napkin ring with a diamond cut work and embossed body having applied, open work, twisted rope borders, c.1860. The shaped cartouche contains the inscription: John. This beautiful napkin ring measures 1 3/4" in diameter, 1 1/4" tall and weighs 27 grams. Inscribed as described above, the soft, warm, original finish is present, with no buffing or machine polishing. The excellent original condition and clear, crisp detail with no removals, repairs or alterations, make this an especially attractive offering.